An old habit sometimes becomes an inspiration for inventors or entrepreneurs to make achievements. For John Lee, the chief executive of reward-based mobile advertising platform operator Buzzvil, note-taking is a habit that has long served as a driving force behind his successful entrepreneurship which started early in his life. The CEO, a voluminous note-taker since he was grade school student, keeps more than 3,000 pieces of paper, on which he scribbled down his ideas and thoughts, at his home. One of the ideas from the notes inspired him to invent an easy-to-use doorstopper when he was middle school student. He patented the idea for it and sold the product in Korea and Japan. The trove of ideas in his notebooks also helped him to launch three businesses before graduating from university. He hit the jackpot by selling two of them to Internet giant Naver and e-commerce firm Tmon. Now using mobile note-taking application Evernote, he keeps what he calls a death note -- like the notebook featured in Japanese comic-based film “Death Note,” -- to profile people with whom he wants to work together to infiltrate the global market. “Many Korean IT services, including Pandora TV and Cyworld -- most of which were unprecedented in other markets when they were first launched -- have failed to succeed on a global scale,” CEO Lee told The Korea Herald in an interview last week. “The main reason -- among many -- is that the developers worked in the way they did in Korea. That is why I am looking for global developers,” the serial entrepreneur said. Founded in March 2013, Buzzvil now has 6 million subscribers for its lock screen advertising platform Honeyscreen in Korea, Taiwan, Japan and Malaysia. Seeing the firm’s potential for growth, global investors including Softbank have invested a total of 17 billion won ($14 million) in the Korean firm. Subscribers can receive membership points by flipping through ads on the mobile app, and they can save and use the points as cash online and offline. Through partnerships with companies in a range of industrial sectors, including credit card, telecom, and mobile game, the Seoul-based start-up provides a tailored ad platform installed on the apps of partner firms. The reward-based app is a good match with the credit card issuers, mobile game firms and mobile carriers as they can offer their customers the points as benefits. Mileage service OK Cashbag, online retailer 11st Street, both of which are run by SK Planet, deploy Buzvil’s ad platform. “SK Planet said the project with Buzzvil was the most successful among others for the past three years,” the CEO said. Buzzvil, which patented its software development kit for a lock screen ad platform in 20 countries, including the U.S., Japan, and Taiwan, is now in talks with domestic and global credit card and telecom companies to have the firm’s ad platform built upon their apps. In line with its goal to increase presence in global markets, the company only hires locals at its global offices. In addition, the CEO wants to attract skilled developers from other nations. At Buzzvil’s office in Jamsil in southeast Seoul, a French UX designer and a Silicon Valley app developer are working with the Korean employees. The self-taught Silicon Valley developer, called Teddy, came to Korea because of 2NE1, a K-pop band, in 2012. “Whereas other Korean start-ups were hesitant to even interview me, Buzzvil’s temporary San Francisco office made me feel like one of them from the start,” Teddy said. 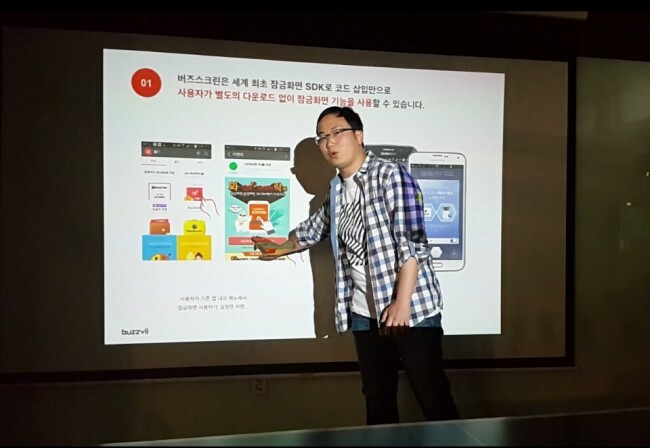 “Buzzvil successfully blends the agile culture of Western start-ups with the topnotch experience of traditional Korean corporations,” the Buzzvil developer said. Among some perks granted to the workers at Buzzvil, include language education, in-house coding classes run by Buzzvil developers for nondevelopers and exchange programs among the global offices. Buzzvil’s employees can work at the global offices for several weeks if they want. The largest benefit for workers, according to Lee, is they can learn about how a start-up grows with a seasoned and serial entrepreneur like himself. “The members of Buzzvil have diverse work experience. Some used to work for social commerce and travel app companies and others worked at an operator of a restaurant recommendation app,” CEO Lee said.